As soon as I saw that glorious ball of fire in the sky I knew it was the right time for Hair Dazzle. Hair Dazzle are thin threads of sparkly prettiness that you can design to match or stand out in your hair. They last up to 2 weeks, and you can heat style them! I popped some around the front of my hair and love the little hint of sparkle they give. 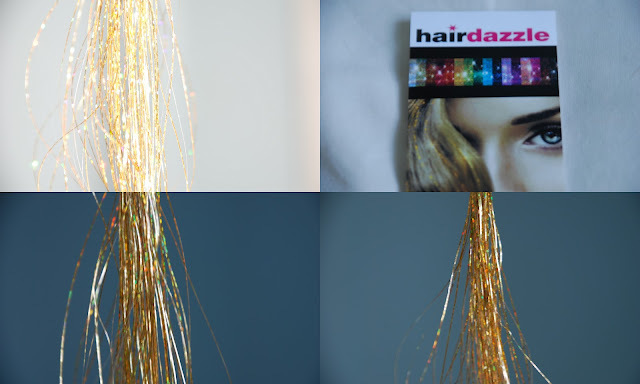 For £12.99 you get 100 strands and they do a huge variety of colours, for subtle to really glitzy. I could imagine these in a fishtail plait for a festival, or through a top knot for a party. What do you think of my sparkly hair?